Hop on over to Amazon where you can snag this Black Forest Gluten Free Juicy Bursts Mixed Fruit 40-Count Pouches for just $4.54 shipped when you clip the 30% off digital coupon and opt to Subscribe & Save! That’s only 11¢ per pouch delivered right to your door! This seems like a great deal as Walmart.com currently has this 40-count package priced at $6.98. Final cost $4.54 shipped – just 11¢ per pouch! These Quaker Rice Crisps are a great snack! Play in just 20 minutes! Hop on over to Amazon where you can snag this Love Letter Boxed Edition Card Game for just $5.86 (regularly $11.99)! Be sure to check out all the amazing reviews. This card game includes just sixteen game cards, but provides hours of fun with the elegant and simple design features. A game of risk, deduction and luck, it can be played in just 20 minutes with a group of two to four players ages 10 and up. Are these 2018 toy picks on your Christmas lists? 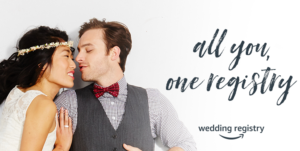 The post Sign up for an Amazon Wedding Registry for 20% Off & Free Gifts appeared first on FTM. Hop on over to Amazon where you can snag this Quaker Rice Crisps Savory Mix 30-Count Single Serve Bags for just $11.33 shipped when you clip the $3 off digital coupon and opt to Subscribe & Save! That’s only 38¢ per bag delivered right to your door! This variety pack includes Buttermilk Ranch, Cheddar, and Sweet Barbecue flavors in convenient snack size bags. Final cost $11.33 shipped – just 38¢ per bag! Amazon: Arm & Hammer Power Paks 97-ct JUST $8.36 (Reg $15.59) – Only 9¢ Each! Need someone to clean? Amazon’s got you covered! Through September 23rd or while supplies last, hop on over to Amazon where you can save $20 off deep cleaning or spring cleaning from Amazon Home Services! No promo code is needed as the discount is reflected in the prices shown. Note that prices will vary based on you location, house size, and cleaning needs. Services must be completed within 90 days of purchase. What is included in a deep cleaning or spring cleaning? How does Amazon Home Services Work? Select your cleaning service and appointment settings during checkout. Then, your pro will confirm your appointment arrival time frame by email or phone. The payment is then issued directly from the card you have on file in your Amazon account. Amazon Home Services handpicks the best service providers in your neighborhood and requires all service pros to be background checked, insured, and licensed if applicable. AND, all services are backed by their Happiness Guarantee so if you’re not satisfied, they’ll make sure the job gets done right! Is a cleaning person REALLY worth it? Check out our thoughts!